The Snugpak All Weather Shelter is an impressive 9.3m2 rhombus shaped tarp shelter. It is designed for Bushcraft, Wild Camping, Group Activities, Military and Cadet Use. It is the perfect complement to any outdoor pack and will provide versatile protection from all-weather elements. Designed by experienced military veterans, the Snugpak® All Weather Shelter can provide you with protection from Sun, Wind, Rain and Snow all year round. Designed as a diamond-shaped (Rhombus) tarp, the All Weather Shelter can be configured as a Fly, Tarp, Lean-to Shelter, Emergency Bivvi, as well as other freestanding shelter designs, making it ideal for Wild Camping, Fast and Light Ventures and Expeditions or as an emergency shelter for both individuals and small groups; it can also be utilised as an emergency stretcher if necessary. The Shelter is a light foliage green, making it suitable for use in the British Countryside, and is compliant with the current codes of practice for Wild Camping. 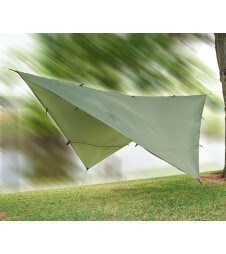 It comes complete with four extendable Guy-Lines, and eight lightweight Alloy Tent Pegs. If benighted, individuals can use the small, lightweight poppers along the edges to turn the All Weather Shelter into an impromptu bivvi bag, creating a waterproof, contained, sleeping area. Packsize 24cm x 12cm / 9" x 5"